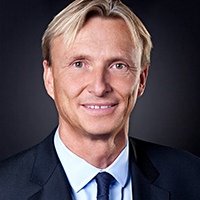 Per Eriksson has been serving as CEO of providers Net Entertainment since taking over from Johan Öhman in March 2012. Prior to that he spent 26 years in the IT industry working as president, chief executive and executive chairman of e-commerce IT retailer Dustin Group and head of computer technology company Dell EMC in Europe, the Middle East and Africa, as well as chief executive officer of Dell Nordic. He holds a Bachelor of Science degree in business administration from the University of Stockholm.